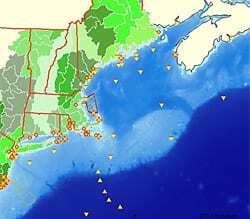 With decades of experience designing, building and operating marine observing systems of many types around the world, the Institution has established a Center for Ocean, Seafloor and Marine Observing Systems (COSMOS) to provide administrative, management and systems engineering oversight of large observatory and observing systems projects underway at WHOI. COSMOS will serve as a central contact point for scientists at the Institution and at universities and research labs around the country who use Institution systems and facilities, and will help develop new sensors and systems for use by the U.S. scientific community. The Martha’s Vineyard Coastal Observatory (MVCO), located south of Martha’s Vineyard and exposed to forcing from the open ocean, is owned and operated by the Woods Hole Oceanographic Institution (WHOI). MVCO was established with funding totaling approximately $2.5 million from the National Science Foundation (NSF), the Office of Naval Research (ONR), WHOI, and private donors. Funding for operations and maintenance is provided by WHOI, government agencies, industrial sources, and user fees. 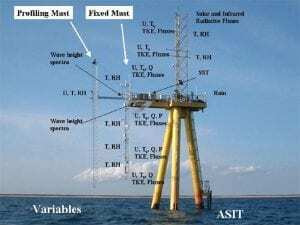 The MVCO consists of a shore laboratory, an onshore meteorological mast, an undersea node, and an air-sea interaction tower (Figure 1). All components are served by a fiber-optic cable, which provides high power and two-way, real-time communications, so that scientists and engineers can employ, for sustained in-situ measurements, technologies that were previously used only in the laboratory and on shipboard. Since becoming operational in 2001, the MVCO has enabled research funded in excess of $12 million, with sources including NSF, ONR, the National Ocean and Atmospheric Administration (NOAA), the National Aeronautics and Space Administration (NASA), and the National Renewable Energy Laboratory (NREL). 2007 is a busy year for the MVCO, with scheduled projects including development and application of optical technologies for quantifying and imaging phytoplankton (Heidi Sosik and Rob Olson, WHOI), funded by NSF and the Moore Foundation; a NASA-funded study of the dynamics of phytoplankton blooms and their effect on the optical properties of the ocean (Heidi Sosik, Steve Lentz, and John Trowbridge, WHOI); an NSF-funded study of the physical oceanography of inner shelves (Steve Lentz, WHOI); a NOPP-funded project to develop in-situ mass spectrometry for cabled observatories (Rich Camilli, WHOI); an ONR-funded project to advance docking capabilities for autonomous underwater vehicles (Tom Austin and Ben Allen, WHOI, et al. ); a NOAA-funded study of air-sea gas fluxes (Wade McGillis, Lamont-Doherty Earth Observatory, et al. ); NASA- and NOAA-funded investigations of optical properties of the coastal ocean (Ru Morrison and Doug Vandemark, University of New Hampshire, et al. ); and multi-institutional ONR programs addressing underwater communications (Jim Presisig, WHOI, et al. ), the dynamics of wave-formed sand ripples (Peter Traykovski, WHOI, et al. ), and the dynamics and optical and acoustical properties of suspended particles (John Trowbridge, WHOI, et al.). The Ocean Observatories Initiative (OOI) of the Ocean Research Interactive Observatory Networks (ORION, http://orionprogram.org/), to be funded by the National Science Foundation (NSF) and managed by NSF and the Joint Oceanographic Institutions (JOI), is close to inception. Based on input from the oceanographic community, the ORION advisory committees have established conceptual network designs for the four components of the OOI: the global scale nodes (GSN), the coastal scale nodes (CSN), the regional cabled nodes (RCN), and cyber-infrastructure (CI). JOI and NSF have released requests for proposals to establish implementing organizations (IOs) for the CI, RCN, and combined GSN and CSN. The Woods Hole Oceanographic Institution (WHOI) is leading a multi-institutional team that will compete to become the C/GSN IO. The WHOI-led proposal is due in June, and a decision by NSF and JOI is expected by the end of 2007. WHOI participants in the IO proposal-writing team include Bob Detrick, Al Plueddemann, Libby Signell (project manager) and Bob Weller (lead principal investigator). Of particular interest to WHOI is the Pioneer Array (Figure 2), a component of the CSN conceived at WHOI by Glen Gawarkiewicz, Al Plueddemann, Breck Owens, and Heidi Sosik. 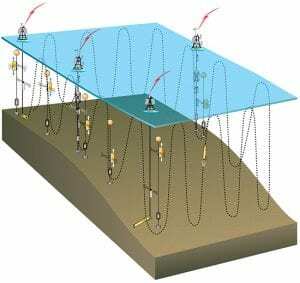 The Pioneer Array is designed to capitalize on developing mooring and vehicle technologies to enable sustained, continuous, adaptive sampling at temporal and spatial scales that are not resolvable with traditional methods, which will enable scientific investigations of physical, biological and chemical processes near complex, evolving features such as fronts, eddies, and intrusions. 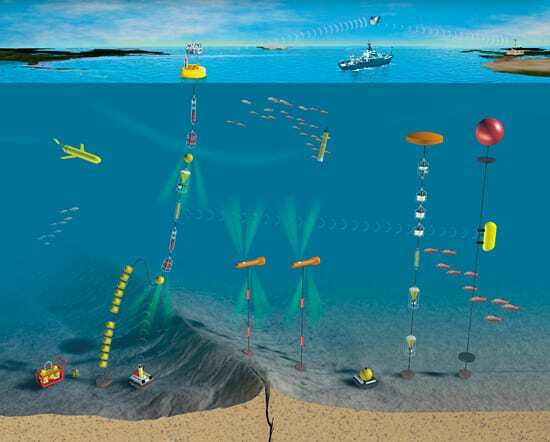 The Integrated Ocean Observing System (IOOS, http://ocean.us/) is moving into a new phase. After several years of funding IOOS through congressionally mandated earmarks, the National Oceanic and Atmospheric Administration (NOAA) Coastal Services Center announced an open competition for 2007 funding to support regional integrated ocean observing system development, with three focus areas: (1) development of regional coastal ocean observing systems (RCOOS), (2) development of IOOS applications and products for regional stakeholders, and (3) data management and communication by local data network nodes. After a competitive pre-proposal process, WHOI personnel were invited to submit four full proposals. A multi-institutional proposal led by John Trowbridge aims at development of the Northeast RCOOS (Figure 1), in parallel with an ongoing planning effort to establish the corresponding regional association (RA), the Northeast Regional Association of Coastal Ocean Observing Systems (NERACOOS). Scott Gallager led a proposal to establish a mobile Northeast bentho-pelagic observatory (NEBO) to support fisheries and ecosystem management. Hauke Kite-Powell proposed to develop procedures and tools to maximize the economic return from the Northeast RCOOS. Janet Fredericks proposed to develop and implement Open-Geospatial Consortium/SensorML standards for quality assurance and quality control for in-situ ocean sensors.